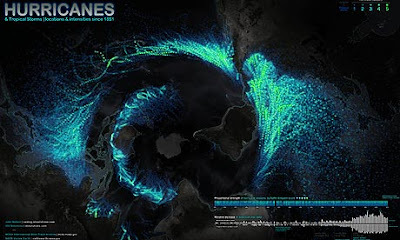 Data Store posted a very cool visualization of the world's hurricanes since 1851 by John Nelson. The underlying dataset is from NOAA's massive database of extreme weather, available for download in various forms here. For those interested in playing with the data, we imported the data about all hurricanes since the 2000 season from the 6MB CSV version of the file containing all storms into Fusion Tables for people to play with: Global hurricanes since 2000 season. Each storm has multiple rows based on that storm's movement. If you do something interesting with the data, we'd love to see it! On Monday, our friends at The Guardian Data Store posted a very cool visualization of the world's hurricanes since 1851 by John Nelson. to host a debate in Kings Cross, London on the topic of the role of data in international development. Debate participants were Douglas Alexander MP, Salil Tripathi (Institute for Human Rights and Business), Rachel Rank (Publish What You Fund), and Simon Rogers (The Guardian Data Store). Issues covered include the importance of transparency around foreign aid and its impact on government behaviors, especially censorship and surveillance. Video below! Tripathi and Alexander addressed the complex issue of how sanctions may help chill speech instead of foster it if data is not analyzed. The night ended with a great case for telling the story of political/social/economic development through data and also how critical the Internet has become in telling stories of people who don't usually have a voice. On October 16, Google teamed up with The Guardian to host a debate in Kings Cross, London on the topic of the role of data in international development. Debate participants were Douglas Alexander MP, Salil Tripathi (Institute for Human Rights and Business), Rachel Rank (Publish What You Fund), and Simon Rogers (The Guardian Data Store). Issues covered include the importance of transparency around foreign aid and its impact on government behaviors, especially censorship and surveillance. Video below! O'Reilly data guru Alex Howard writes about revisions to San Francisco's open data legislation aimed at putting more resources into the already vibrant innovation economy around the city's open data. The legislation would create a chief data officer in the mayor's office to facilitate data sharing and data-driven decisionmaking. Thomas Davenport, Paul Barth and Randy Bean write for MIT Sloan Management review about how "big data" is different from traditional data processing and analytics in enterprise. Frankly, though, their argument only underscores a shift in the way we approach and derive insight from big data, not just its size—that is, the most disruptive aspect of "big data" is the innovation it drives in how we gather, analyze, and utilize data across domains and disciplines. R@G: What important problem would you like to see solved with data? RS: I’d like my beautiful, smart, non-verbal, (severely) autistic brother, Alex, to be taken seriously as the intelligent human being he is and to be given the opportunity to speak. One day, Data Scientists could solve this. Generally I want to see data being used to solve problems of social value. We didn't post a roundup last Friday due to mitigating circumstances (sorry! ), so this week's roundup covers the last two weeks. is Professor of Internet Governance and Regulation at the Oxford Internet Institute/Oxford University. He is also a faculty affiliate of the Belfer Center of Science and International Affairs at Harvard University. Many of us see open data as a potent tool to enhance and improve citizen empowerment and participation. The idea is not just that government data is brought to citizens in a more meaningful way. Many also hope for a rich ecosystem of open data sources and developers yielding amazing apps that provide society with novel insights. 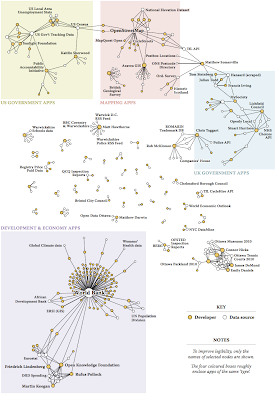 Based on Zarino Zappia’s initial work and data collection, he and I haven taken a sharp look at this emerging network of open data sources and app developers. Data for developers of 175 open data apps were collected, including what data sets they had used. We then mapped the flow of information from initial data sources through the applications that developers had created to end-users. Given the high hopes surrounding open data development, the results were somewhat sobering. The open data community that emerged from the data set we analyzed was relatively fragmented and disparate, with (as we noted in our paper), "far less participation and combination of data sources than originally hoped. Instead of a wide open playing field devoid of hierarchies we find developers and datasets alike become crucial linking points—crucial gateways for the flow of information—between sub-communities of open data development based on specific tasks or contexts." We also found that most open data developers focused on a relatively narrow context for their applications. Thus insights they might have gained in one context – say local mapping apps - did not get transferred over easily into different contexts like apps on economic data or development. Most open data apps were created by individuals (71 percent), and as far as we can tell only half of these individuals belong to an easily identifiable, working open data developer community. When and where these communities did form, data sources often provided a natural conduit. Thus perhaps unsurprisingly, apps that combine different data sources were also comparatively rare. Moreover, the network of open data developers seems to replicate the tendencies towards a recreation of hierarchies and limitations on participation that research has shown to saddle the blogosphere, e-rulemaking, or (more recently) Wikipedia. While these results may disappoint, a few words of caution are in order. First, despite our efforts our data collection may not have captured the ecosystem comprehensively enough. Second, we may have looked at open data developers too soon (data collection took place in 2011). It is still early days, and perhaps as more data sources are added, and apps gain in popularity, not only the number of developers may grow, but they may also become better connected. However, it is important to note that our initial findings were confirmed in in-depth interviews with a number of renowned open data developers. Perhaps, though, these results also capture an important opportunity: if open data developers are not sufficiently connected with each other and the broader community, it may be because there is not yet an easy way to do so, independent of the large platforms providing data sources. Remedying that may help the open data ecosystem more than the release of further data sources or another application contest. Viktor Mayer-Schönberger is Professor of Internet Governance and Regulation at the Oxford Internet Institute/Oxford University. He is also a faculty affiliate of the Belfer Center of Science and International Affairs at Harvard University. our co-sponsorship of a fellowship with ZERO1, an organization that aims to inform strategies for research, development, and creativity via provoking challenges that address the complex world in which we live. ZERO1 recently launched their Garage, envisioned as a platform for creative minds from the arts and culture, business, science and academic sectors to interact, engage, and empower change. There’s a natural synergy here: the Internet and new digital technologies and platforms are creating extremely fertile ground for artists to create, share, finance and promote their work. Kickstarter alone boasts 30,000 successfully funded projects, the vast majority coming from artistic, content-creating categories: music, film & video, design, art, theatre, and writing & publishing. ZERO1’s massive network from a huge range of fields could have a powerful impact on public policy issues affecting art, technology and culture. We asked Joel Slayton, ZERO1 Executive Director, a few questions about how and why ZERO1 works and what they hope to accomplish. Q. What do you hope to achieve through the launch of the ZERO1 Garage? What kind of change to you hope to inspire through the launch of the Garage and through supporting artists? A. Facing the challenges of the 21st century requires new forms of creativity and innovation from climate change to human rights to sustainability. The mission of the ZERO1 Garage is to apply the principles of artistic creativity to these real world challenges. We believe that art, at the frontier of technology, broadens our critical understanding of the world by provoking new ideas, experimentation, and creative strategies. Artists inspire the possibilities that shape contemporary culture, sustain what matters most, and open and motivate society to better itself. The ZERO1 Garage is envisioned as a platform for risk-takers from the arts and culture, business, science and academic sectors to interact, engage, and spur innovative change: part incubator, part research lab, part exhibitions center. Q. Art and technology live in increasingly overlapping spheres, with heavy influences on each other and dramatic shifts in the content communicated through each. How as the internet specifically changed the way that people create and consume art? A. We believe that artists—artists/engineers, artists-scientist, artists-designers, artists/technologist—are the new provocateurs, and an untapped source of social innovation. Clearly, things get interesting where disciplines rub up against each other. ZERO1 is first and foremost a network supporting these sorts of collaborations. What we hope to achieve is to harness the tension/friction between disparate fields from arts to industry to explore how these intersections can yield new and fresh ideas. Contemporary art is informed and inspired by a rapidly evolving techno-cultural public(s) which is, of course, shaped by the realities and challenges of the Internet and its impact on society (local/global). The Internet continues to be a serious terrain for artistic exploration including issues of protocol, creative process, subject matter, and new forms of participatory and social engagement. The role of the artist is that of the provocateur, whose goal is to challenge the status quo, disrupt expectations and to inspire alternative solutions. Q. Artistic production can be a type of “data,” qualitatively and creatively informing policy debates by introducing new perspectives and modes of thought and consideration for an issue. In your view, what’s one of the most pressing policy issues and how does art, science, design or technology inform that debate? What kind of policy action do you hope that creativity can inspire? A. One of the most pressing questions involves understanding how to shape open data policy interactions to push the boundaries of online or networked culture by addressing contemporary social challenges. Realizing this ambition requires innovative public/private partnerships that serve to enable new opportunities for cultural production and therefore beg the question of new legal rights and mechanisms that will ultimately empower the public. Artistic experimentation (as it was for with the emergence of the Web) will unquestionably inspire deeper understanding and critical assessment leading to more robust and informed open data policy initiatives. For more information on ZERO1 and their ongoing Biennial celebration’s exhibitions and performances in the Bay Area, visit www.zero1biennial.org. A few weeks ago, we announced our co-sponsorship of a fellowship with ZERO1, an organization that aims to inform strategies for research, development, and creativity via provoking challenges that address the complex world in which we live. ZERO1 recently launched their Garage, envisioned as a platform for creative minds from the arts and culture, business, science and academic sectors to interact, engage, and empower change. (UC Berkeley School of Information) and Robbie Allen (Automated Insights). The conversation ranged from data-driven scouting in baseball to the value of automating narratives around data from events, especially ones like fantasy sports match-up, where the outcome is relevant only to a few individuals. Video embedded below! We hosted our third Hangout on Air on data-driven innovation this morning. This Hangout focused on data in sports, a theme that is never more appropriate than in the month of October (at least in the US). Our guests were Andy Brooks (UC Berkeley School of Information) and Robbie Allen (Automated Insights). The conversation ranged from data-driven scouting in baseball to the value of automating narratives around data from events, especially ones like fantasy sports match-up, where the outcome is relevant only to a few individuals. Video embedded below! Almost 20 years ago, Francis Fukuyama wrote a book called Trust, which claims that social capital and shared values and ethics create conditions necessary for modern economic growth. He argued that societies that facilitate stronger relationships of trust are able to innovate and scale more effectively than those that do not. Two factors contributing to trust in society are structural: legal certainty and transparency about how laws are enforced. Together, these elements grow trust in a way that encourages investors to take necessary risks when it comes to businesses and markets. By contrast, when information is incomplete or not readily available, people are unable to make informed decisions or accurate forecasts for the future, making them more risk averse or creating moral hazard. To see if that theory applies today, the Milken Institute provided us with a preview of data being assembled for the Opportunity Index: Access to Global Capital which will be released in early 2013. To help us look for correlations between measures of government transparency, foreign direct investment, and GDP, they assessed 34 different indicators that fell into four general categories: transparency of business, the political and legal system, the policymaking process and quality of regulation. For all countries, higher scores in the composite and in three of the four transparency categories (business, political and legal system, and policymaking) correlate to both higher GDP per capita and FDI per capita. Among advanced countries, Singapore, New Zealand and Hong Kong remained the best-performing countries in transparency from 2007 to 2011. The U.S. ranking slid from 12th in 2007 to 16th in 2011. Two of the factors behind this decline were increased controls on international capital markets and lower scores on the quality of its credit market/securities exchange regulation. Bahrain, Malaysia and Botswana were the three most transparent emerging and developing countries in 2011. Albania witnessed the greatest jump in transparency scores, improving in all four categories. Its strengths included more disclosure, a lower burden of government regulation, more public trust of politicians, lower costs from terrorism/organized crimes and more transparency in the policymaking process. China and Azerbaijan both improved their transparency rankings by 19 places. China gained ground in all four categories from 2007 to 2011, with the most improvement in transparency of policymaking. Public trust of politicians and a dramatic reduction in time spent paying taxes are other key contributors to China’s success. In Azerbaijan’s case, transparency of doing business and quality of regulations showed the most improvement. Specific strengths were less time/money spent starting a business, better credit/securities market regulation and better investor protections. When we ran our own analysis of their data, we also found that when even we hold GDP per capita steady, foreign direct investment and greater transparency are highly correlated. 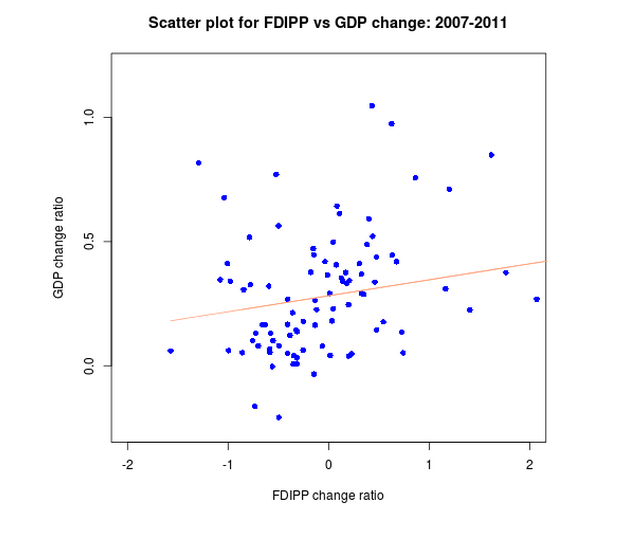 And with a few exceptions, increases in transparency also correlated positively with increases of FDI per capita. While it’d be premature to say that increased investment is a direct result of government transparency in all 108 countries in the index, surveys published last year by Booz & Co. showed that legal certainty affects decisions made by angel investors and venture capitalists: 81% of investors said they would be more likely to invest during a “weak economy” with legal certainty than a strong economy without it. This is only the beginning of the work that’s being done to quantify what it takes for governments to facilitate growth in the new information economy. Keep an eye out for more from the Milken Institute in the next few months. In Estonia, 100% of publicly educated students will soon learn to write code starting in first grade. The crucial difference between Estonia’s approach to tech and education and the approach taken by the US and many other countries is Estonia’s emphasis on creation versus consumption. While Estonia fosters making technology, our major tech/education initiatives focus merely on using technology. We’re teaching our kids how to use technology as an educational tool while the Estonians are training developers. Of course, it’s not surprising that Estonia is ahead of the curve on computer science education. Estonia has fully embraced the Internet as a tool for government service delivery and business—with online voting, paperless Cabinet meetings since 2000, and 99% of bank transfers happening online. It has had free public wifi (something that's literally just a joke in the US) for the past decade. All this, despite the fact that only half of Estonia’s 1.4M citizens had a telephone line in 1991 when the tiny country regained its independence from the Soviet Union. Meanwhile, the debate continues elsewhere about whether encouraging everyone to learn programming is as sensible as encouraging everyone to learn to read or as seemingly absurd as encouraging everyone to learn plumbing—whether it’s a 21st century life skill or just the hottest specialized profession du jour. But a few things are certain: it’s a great way to learn computational thinking (recursive, heuristic, and abstract reasoning) and the students who choose to explore it on their own are overwhelmingly male and white. It's a great time to be a six-year old in Estonia. The US and other countries should think seriously about upping our game when it comes to teaching kids how to make technology—especially if we want to retain our reputation as a nation of builders and dreamers and not just one of consumers. in San Francisco. Anthony Townsend, Research Director at Institute for the Future, delivered one of the Day 3 keynotes on the concept of "smart cities" and how technology is changing the urban landscape—and the importance of engaging the citizenry in effectively designing, selecting, and implementing technology in planning cities. 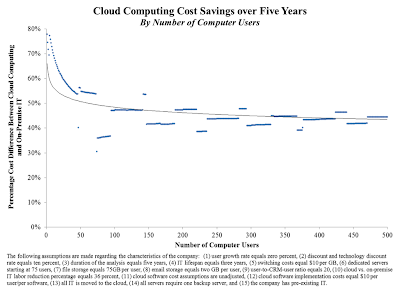 On ReadWriteWeb, Brian Proffitt writes about increasing demand across business sectors for professionals with data science skills. Explaining a flurry of job postings seeking MATLAB and business skills in one individual, Proffitt writes, "The meshing of technology and business skills is a big "get" for most businesses, as any geek who can speak numbers or any suit who can grok tech is highly sought candidates." Over at The Atlantic, Betty Morais tells the story behind publishing start-up "Colliloquy," calling it a "choose-your-own-adventure model for the data-tracking age." The narrative in each book comes with multiple "pathways" for readers to make decisions about the direction of the plotline. Colliloquy records reader choices and provide that data to authors, who can make decisions about future installments of their book series based on reader feedback. Really interesting example of data-driven innovation in an industry where we don't often talk about data's potential! Last week, Code for America held its 2012 summit in San Francisco. Anthony Townsend, Research Director at Institute for the Future, delivered one of the Day 3 keynotes on the concept of "smart cities" and how technology is changing the urban landscape—and the importance of engaging the citizenry in effectively designing, selecting, and implementing technology in planning cities. 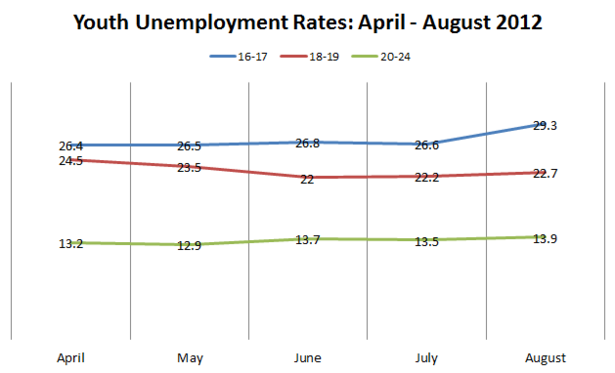 In Europe, youth unemployment numbers are even worse. As of May 2012, nearly 11 million young people were out of work across OECD countries. Youth unemployment has reached an alarming rate of 17.1%, more than double the unemployment rate affecting the general population. Greece and Spain have fared the worst, burdened with youth unemployment rates of more than 50%. And the near-term outlook is not much better: In, 2015, approximately 660 million young people will either be working or looking for work—an increase of 7.5% over the 2003 figure. What can we do to change course? We can start by creating an economic environment that nurtures entrepreneurship. While not a cure-all for general economic malaise, data supports the assertion that entrepreneurs are net job creators in an era with high unemployment and an economy that can’t create jobs at a sufficient pace to employ everyone entering the workforce. As new entrants to the workforce, youth and recent college graduates are particularly susceptible to slow job creation. Entrepreneurship is critical for economic growth, and its appeal to youth is something that policy initiatives should address. The notion of entrepreneurship as the solution to youth unemployment is gathering steam globally. One recent article describes tech startups as the “last refuge of Spanish optimism,” and another on CNN as being nearly the only option for young university graduates in Greece, who are pioneering a “digital renaissance” and aiming to reinvent the Greek economy. These articles point to an inspiring trend: Not only does entrepreneurship get young people into jobs, it means they’re creating jobs for everyone else, too. The challenge of realizing the economic benefits of youth entrepreneurship is (at least) two-fold: individuals and society need to embrace the reality of risk and the fear of failure, and we need an increased institutional capacity for rewarding entrepreneurial attitudes and cultivating an environment that makes entrepreneurs successful and enables recovery from failure. Innovative sites like Young Entrepreneur and Teens in Tech are playing a vital role in this regard, creating tools, resources, and networks for youth to create innovative businesses. By bringing resources tailored toward youth entrepreneurs online, youth can find and join a community of other entrepreneurial youth with whom to vet ideas, learn new skills, and fail and start over. Increasing the number and scope of programs like these will be important for bringing more youth into the entrepreneurial fold, shifting cultures and attitudes about what it means to be an entrepreneurial and what it means to be successful. While the global economy struggles to recover and many young people are unable to secure employment, encouraging entrepreneurship is a sustainable policy objective that can ensure growth. If you’ve seen other sites, companies, or resources dedicated to this issue, let us know in the comments! Download the spread as a PDF here. is a researcher and Assistant Adjunct Professor at NYU's Rudin Center for Transportation Policy & Management. Accurate information is inextricably linked to urban mobility: Nearly half of all urban dwellers own smartphones, which makes it possible to travel seamlessly between subways, buses, taxis, bicycles and by foot. On-the-go information via smartphone is now the way people check schedules, stop locations, delays, and safest routes. Social media tools, such as Twitter, allow transportation providers to communicate directly with users: alert customers about service changes, suggest alternative routes, and amplify the message to friends and neighbors. Ideally, these actions would occur within moments of a delay. Twitter is superb platform, since it is free, fast and packed with dynamic features. But our research at NYU’s Rudin Center indicates that transportation providers in the New York Metropolitan region have yet to use Twitter to its fullest potential. Our research, based on all tweets from May 1 to June 30, 2012, offers policy recommendations for using Twitter in a transportation setting. Assuming that Twitter followers indicate a willingness to receive information and marketing posts from that organization, these findings demonstrate the relationship between ridership numbers and fans of the organization. There is a striking difference between public and private Twitter accounts: while the Port Authority of NY & NJ’s PATH has approximately 1 follower for every 20 riders, JetBlue has 20 followers for every 1 passenger. Although the airlines listed above have a lower number of daily users than transit organizations do, it is essential for both public and private transportation providers to promote their brands online to generate more messaging among users and fans. Twitter should be used for up-to-the-minute information, customer engagement, and strategic marketing—the right mix of which will result in more followers. JetBlue and American Airlines may direct more resources at customer service than public agencies. But Twitter-connected travelers will use the system more efficiently, feel safer, and have more knowledge of what to expect. Simply put, using social media to connect with travelers will save time and reduce uncertainty and even anxiety. Improving the content will produce more followers, which will, in turn, should lead to more informed, motivated and engaged travelers. Leveraging information technology is key to better transportation. 1Port Authority of NY & NJ. "Annual Airport Traffic Report," 2011. 2AMR Corporation. "AMR Overview," November 2010. 3JetBlue Airways Corporation. "JetBlue Airways Reports March Traffic", Press Release, April 11, 2012. Sarah M. Kaufman is a researcher and Assistant Adjunct Professor at NYU's Rudin Center for Transportation Policy & Management. released a new report, "Demystifying Big Data: A Practical Guide to Transforming the Business of Government" In light of Phelan's commentary, it may be useful to think about the Commission's research as work on data-driven policymaking and data-driven governance. Here's our highlight of articles, reports, and more from the data-driven world! In case you missed our post yesterday, the OECD released their 2012 Internet Economy Outlook—and the outlook is quite good. Every hype cycle reaches a point where people start to forecast the death of said hyped item or term, and "Big Data" is no exception. Writing for Forbes this week, Michael Phelan argues that within a few years, "Big Data" will die and we'll realize it's all about "Any Data." On Wednesday, TechAmerica Foundation's Big Data Commission released a new report, "Demystifying Big Data: A Practical Guide to Transforming the Business of Government" In light of Phelan's commentary, it may be useful to think about the Commission's research as work on data-driven policymaking and data-driven governance. Our kids are no longer growing up in a world where everything takes place in the backyard or neighborhood streets. Rather, their worlds are increasingly digital. They live in the world of social media, where boundaries are constantly being pushed and more information than ever is being shared. It can be unnerving to allow our children to interact in an atmosphere where bullying, sexting and online predators make the nightly news. The media senses our fears and has played up the negative impact of the digital world. However, these reactions are not necessarily healthy or helpful. The Family Online Safety Institute (FOSI) seeks to provide a researched- focused voice in the conversation surrounding families and technology. Our latest white paper, "Calming Parental Anxiety While Empowering Our Digital Youth," helps parents and teachers guide kids in this new digital world by calling out common myths and providing principles to help families make good decisions about their kids’ online activities. It's no secret that the media likes to focus on the sensational. We hear about bullying incidents and assume that social media is the culprit. It's important to keep in mind that there are risks associated with things our kids do every day, from crossing the road to riding a bike. Instead of looking at the negative, we focus on the positive and teach our children the skills necessary to make positive decisions. The same should be true with social media. Consider this: more bullying takes place face-to-face than through social media. A recent study shows that 18% of students say that they have been bulled in person, whereas only 5% have been bullied online. Additionally, it is commonly believed that social media can make kids feel isolated and depressed. However, the Pew Internet and American Life Project found that 78% of teens reported positive personal outcomes from social networking and 65% say they have had interactions through social media that have made them feel good about themselves. In order to help kids and teens make smart decisions online, we need to guide them through the digital world. We need to help them build media literacy skills so they can have the effective digital training they need to become confident digital citizens. By focusing on the good of social networks, we can provide our children the freedom to use the Internet for good while fostering an environment that provides safeguards that families are comfortable with. This year, FOSI launched a new website, A Platform for Good (PfG), emphasizing the power of the Internet to promote collaboration and learning. PfG equips parents and teachers to help teens responsibly navigate the Internet—using the Internet to promote good and connect online. PfG provides tools for teachers to use in the classrooms and resources for parents to connect with their teens to help them become responsible digital citizens. Now, we need to work together to provide our children with a strong foundation that will enable them to convert digital citizenship to a means of doing "good" across their entire lives. We all have a role, from policymakers to parents, teachers to industry leaders—even kids! Take responsibility for your actions to create a safe place, conducive to collaboration and good. The Family Online Safety Institute is here to help embrace the challenges that come with the new digital world. There is no doubt that caution should be practiced, but by coming together and using the Internet as a learning tool, we can help ensure a positive, enriching online environment for all. Stephen Balkam is Founder and CEO of Family Online Safety Institute. The Internet is the most powerful infrastructure we’ve seen yet for the creation, exchange, and implementation of new ideas. By facilitating access to information and collaboration at previously unimaginable scale, one small idea shared online can quickly grow into a world-changing one. As a result, the Internet has become a wellspring of innovation and renewal across the economy, and the numbers prove it. Today the OECD has released its 2012 Internet Economy Outlook, a comprehensive look at the Internet’s ongoing role in transforming the global economy. The report opens with a landmark chapter on measuring the Internet economy. 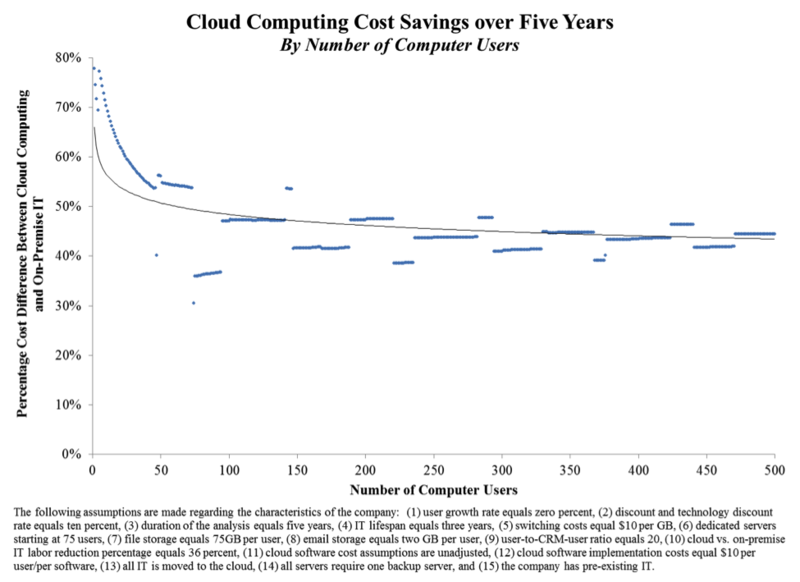 This is a significant addition to the research literature on this subject in part because, as the OECD notes, “there is still no widely accepted methodology for assigning an economic value to the Internet.” They find that up to 13% of business sector value added in the United States in 2010 could be attributed to Internet-related activities—as much as transportation, construction and utilities combined. Ongoing data analysis of the sort undertaken by the OECD here can help inform government priorities and policy developments. Earlier this summer, we released a paper outlining a set of policy ideas that put key qualities that have made the Internet such a vibrant source of innovation at the center of driving economic growth and renewal. With more data demonstrating the value of the Internet to global economies, policymakers will have even more evidence that policies to encourage the development of a robust internet economy to thrive will result in huge economic returns. Derek Slater and Betsy Masiello are Policy Managers at Google. Google “upside down maps,” and you will discover an entire industry based on the thrill of messing with our perceptions. Change the premises on which a map is based, and your understanding of the world changes, too. Put South at the top, Asia at the center—well, you can see why management consultants love these things. The famous “blue marble” photo of Earth from space, free of any geopolitical boundaries, is credited with promoting the environmental movement. More recently, and far more subtly, Google Maps is continuing to change our perceptions. Zoomed in past state borders, the maps dispense with municipal boundaries; the lines that are important are roadways. Whatever that might say about our cultural values or Google’s canny understanding of consumer needs, it does suggest a tantalizing prospect: What if those boundaries were actually erased? How would we redraw them? And how could new municipal boundaries better align government with our needs today? The map of Massachusetts below, taken from the magazine's feature, shows municipalities reorganized based on the the nearest Dunkin' Donuts shop, using Dunkin’ Donuts locations from POI Factory. Click the image for the full set of maps. The term “big data” is often associated with the private sector, but an increasing number of governments on all levels are harnessing their vast stores of administrative data. These data, collected for the day-to-day operational purposes of public programs, provide a valuable basis for creating more effective and efficient public policies and programs. Places ranging from Philadelphia to Washington State have created integrated data systems (IDS) that link administrative records from their health, mental health, education and other human service systems into one data warehouse. Such systems provide policymakers to comprehensive and timely information that is often crucial for understanding—and in turn addressing—complicated problems. In short, as this report notes, IDS allow for “leaps of understanding” that can only occur when an issue is examined from the perspective of multiple public systems or agencies, instead of only one. My colleagues—Dennis Culhane, Stephen Metraux, Manuel Moreno and Halil Toros—and I recently completed a study, funded by the Conrad N. Hilton Foundation, that is an example of how IDS can apply the power of big data to improve public sector services. Our study used an IDS created by Los Angeles County’s Office of the Chief Executive—called the Enterprise Linkages Project (ELP)—to examine young adult outcomes for 23,000 youth who had a history of involvement in the juvenile justice and/or foster care systems. As the graphic below shows, the results were quite striking. 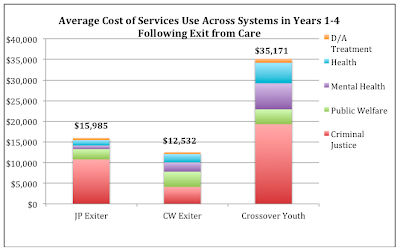 Within four years of being discharged from the juvenile justice system or from foster care (roughly when they were between 18-24), youth used $15,986 and $12,532 worth of county funded, health, mental health, drug/alcohol treatment, criminal justice and public welfare services, respectively. For those youth who had been involved in the juvenile justice and foster care systems—called "crossover youth"—the total was more than twice as high. The study, which provides information at a scope that would have proven impossible in the absence of the ELP, points to the need for increased and more effective forms of assistance to facilitate successful transitions to adulthood by youth who are exiting juvenile systems of care. We anticipate that our findings will inform the ongoing implementation of state legislation that will extend the age of eligibility for child welfare services in California. Studies such as ours can be linked across sites as well to provide a body of evidence on a particular issue that is of more general value to a broader range of jurisdictions and policymakers. As a report from the Coalition for Evidence Based Policy points out, IDS like the ELP can be a cost-effective means to conduct scientifically rigorous studies of programs and interventions that promote positive outcomes among youth aging out of juvenile systems of care, and other populations. From a broader perspective, the demand for the unique type of information that comes from IDS is only likely to grow. The current fiscal environment makes it imperative that public resources are used in a cost-effective manner. This memo from the federal Office of Management and Budget makes it clear that evidence-based policy is on the rise, and that IDS and administrative data will have a large role to play in supplying the necessary evidence. That should be viewed as encouraging news by stakeholders from across the board. Thomas Byrne is a Research Assistant Professor at the School of Social Policy and Practice at University of Pennsylvania. a visualization competition co-sponsored by Google and The Guardian Datastore. On Wednesdays in July, we highlighted several of the entries here on the blog. Today, we're excited to announce the launch of a new competition: How transparent is world aid data? We're looking for visualizations that show how governments are shaping the Internet in relation to international development. Should governments take censorship into account when they distribute foreign aid? What does the current flow of information online/offline looks like vs. flow of foreign aid geographically? What impact do sanctions have on the flow of information? How does that map against foreign aid? How is international development affected by the free flow of information? The announcement page includes links to some datasets under "Get some data" that are a great start. We look forward to seeing what you come up with! The contest is open now until November 26. Back in March, we announced a visualization competition co-sponsored by Google and The Guardian Datastore. On Wednesdays in July, we highlighted several of the entries here on the blog.